Avery Ash: "Many in the public sector feel they are falling behind if they aren't doing something with regard to autonomous vehicles. This sort of urgency without a clear sense of direction leads to bad decisions." DETROIT — Many cities are racing to the autonomous vehicle finish line, but for self-driving vehicle technology to advance, there must be a shift in the conversation. That's Avery Ash's take. Ash is head of autonomous mobility for Inrix, a connected vehicle data and analytics company that acts as an intermediary between the public sector, automakers and operators. 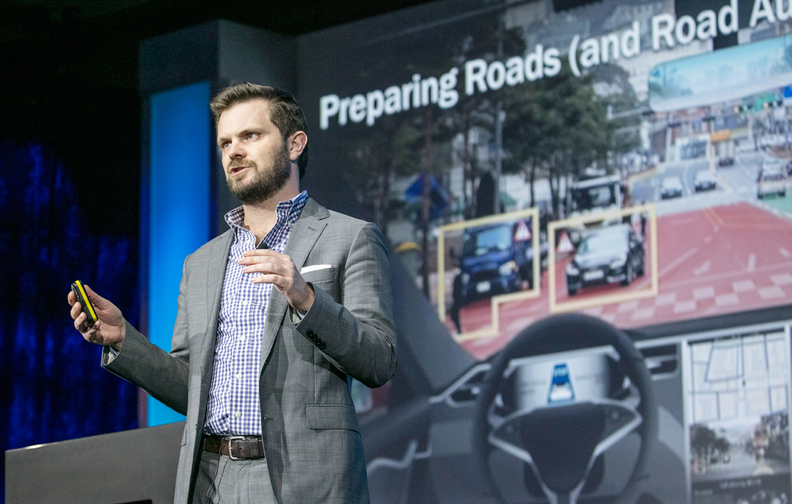 When Ash joined the World Economic Forum's initiative on the Future of Urban and Autonomous Mobility, focusing on Boston, a key theme emerged, he said. "Many in the public sector feel they are falling behind if they aren't doing something with regard to autonomous vehicles," Ash said. "This sort of urgency without a clear sense of direction leads to bad decisions — either unnecessary investments, counterproductive legislation or regulation, confusion and frustration in the public or private sector and consumers alike." Ash urges them to reframe their mindset, which "often describes autonomy as a race to some sort of undefined finish line." "Autonomous vehicles like any other technology should be viewed as a tool to address present challenges," he said. "Not a silver bullet for all the important issues facing cities today." To help cities understand how to interact with autonomous vehicles, Inrix launched AV Road Rules, a platform designed to bridge the data gap between highly autonomous vehicle operators and road authorities. The existing mapping approach has been developed largely without public sector engagement. Street signs and lane stripes have worked well for humans, Ash said, but they don't work well for AVs. With AV Road Rules, cities provide a digital version of their traffic rules. "This resolves a key challenge the industry is ill-positioned for and spending a lot of time and resources developing themselves," Ash said.